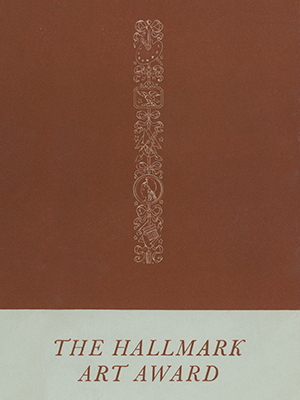 Since founding in 1910 the company that would become Hallmark Cards, J.C. Hall had consistently strived to associate its products with the highest quality fine art. 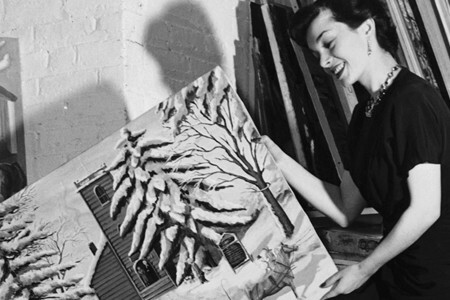 After the successful launch of the Hallmark Gallery Artists line of holiday cards in 1948, which featured historic works from da Vinci to van Gogh, J.C. envisioned a competition to inspire new art on the Christmas theme. The following spring artists from the United States and France were invited to submit paintings for the first ever Hallmark Art Award. Such a corporate sponsored competition, open to any trained artist, was unprecedented at the time. As a result, more than 10,000 artists responded to the call. The competition was directed by Wildenstein Gallery in New York, which exhibited Picasso and other modern masters. 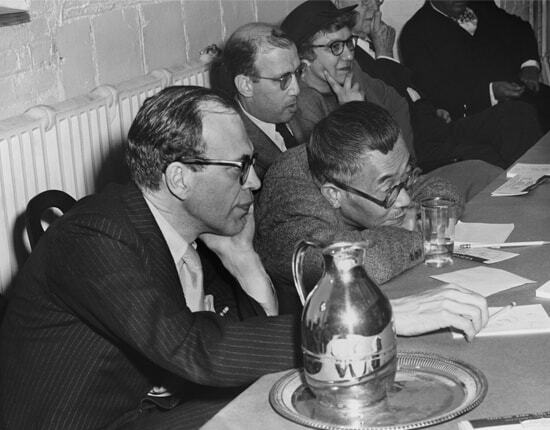 To judge the entries, an international committee was convened of distinguished curators, critics, and artists, including the painter Yasuo Kuniyoshi and filmmaker Jean Cocteau. 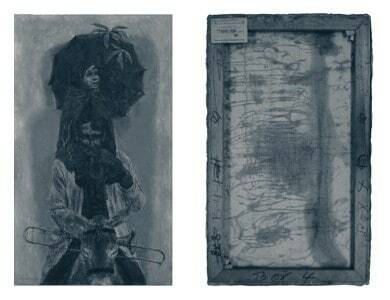 After much deliberation they awarded cash prizes to twenty artists, dividing the Grand International Prize of $3,500 between French artist Eduoard Goerg and American Fred Conway. Among the other notable finalists were Antoni Clave, Oscar Domiguez, Philip Evergood, Philip Guston, and Joseph Hirsch. 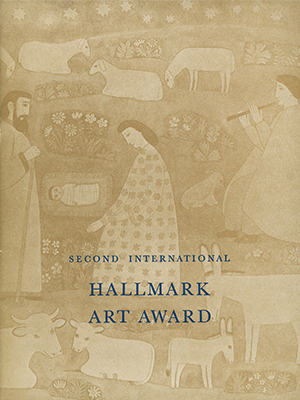 The success of this competition spawned four more International Hallmark Art Awards over the next decade, which were shown throughout the U.S. and Europe. From these competitions Hallmark purchased works by Edward Hopper, Andrew Wyeth, and other prominent artists, becoming one of the first corporations to develop a collection of modern art. 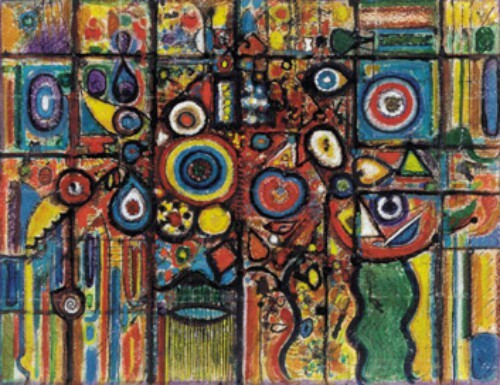 In the years following World War II the United States became a center for modern art, a subject that stirred much public debate at the time. The term “modern” was applied to a variety of styles that overtly challenged academic tradition, ranging from abstraction to social realism. 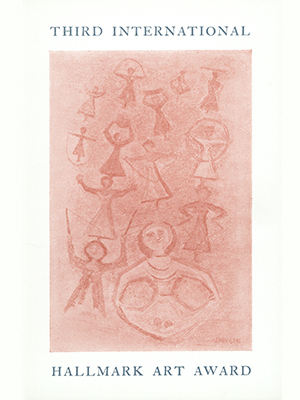 In the summer of 1949, as the Hallmark Art Award was gaining international press, the competition became a political flash point due to its promotion of vanguard art. In France, Communists protested the corporate-sponsored event as a U.S. scheme to export capitalism abroad. Back at home, many involved with the project were accused of having socialist sympathies. In a speech entitled “Modern Art Shackled to Communism,” Congressman George Dondero of Michigan publicly condemned a number of the winning artists, including Phillip Evergood, Joseph Hirsch, and Anton Refregier. One of the judges of the award was the noted Japanese-American painter Yasuo Kuniyoshi (pictured on side bar), who was then president of Artist’s Equity. He drew particular criticism for being “presumably a Buddhist and most certainly a Red fronter,” unfit to judge art for Christmas cards. In spite of the furor, Evergood, Hirsch and several others on Dondero’s “Roll of Infamy” were awarded prizes in the 1949 Hallmark Art Award. 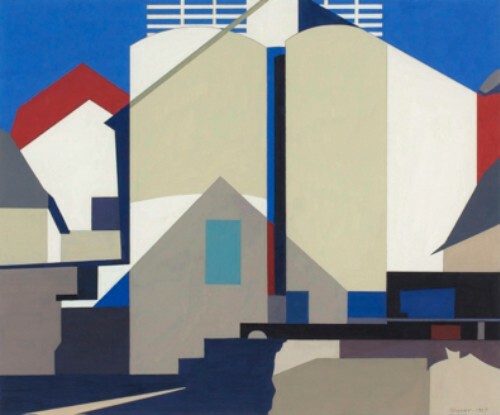 Two years later Anton Refregier, a continuing subject of political scrutiny due to his socialist affiliations, was awarded the Grand International Prize in the Second Hallmark Art Award. Preserving the legacy of the Hallmark Art Awards requires ongoing care, ranging from preventive maintenance to extensive restoration. All of the materials used in making a sculpture, drawing, or painting are subject to distortion or deterioration over time. These effects are due to a wide array of causes, ranging from minor fluctuations in humidity to catastrophic events such as fire and floods. Joseph Hirsch’s painting Journey was compromised by water damage from a flood in downtown Kansas City in 1977. Moisture caused the canvas to shrink and the paint to buckle and separate in response. A complex course of treatment was required to flatten the cracked paint, remove darkened varnish, and correct past paint touch-ups. The artist’s frame, long lost, was also recreated with the aid of vintage photographs so we can again experience Hirsch’s painting in its original context. Other prizewinning works from Hallmark’s five art competitions have also suffered the effects of age and are the focus of continuing conservation treatments. These efforts are reversing damage and arresting further deterioration, ensuring their well being for years to come. Organizing the 10,000 entries to the first ever Hallmark Art Awards. 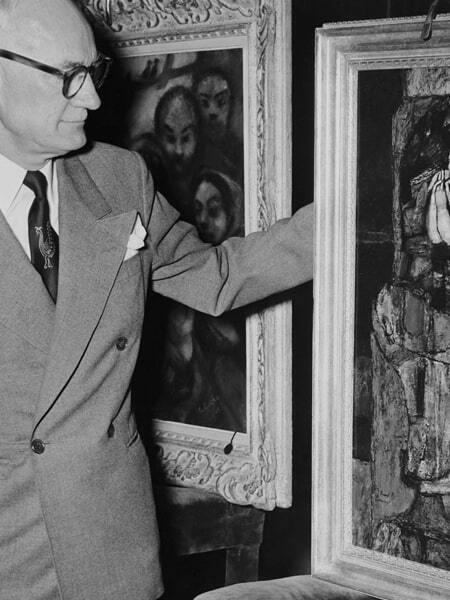 Curator Robert Beverly Hale of the Metropolitan Museum of Art (left) and artist Yasuo Kuniyoshi (right) jurying admissions, 1949. 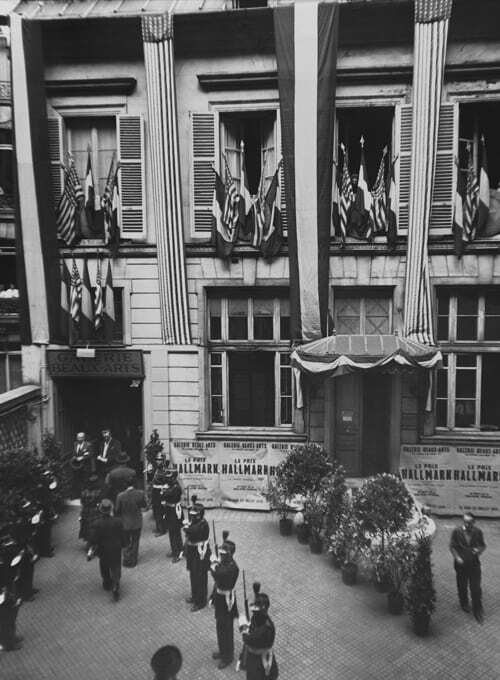 The opening of the Hallmark Art Awards exhibition of the French Section at the Galerie de Beaux-Arts, in Paris, France, June 1949. 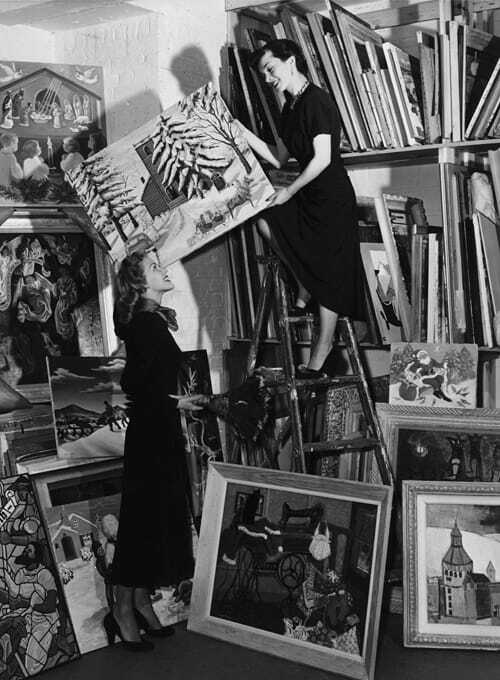 Assistants sort some of the 10,000 entries for the1949 competition. 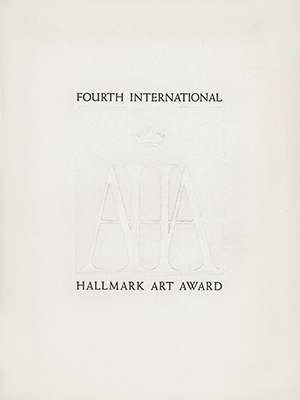 In the April, 1949 issue of Art News, an ad announced a "New International Art Award". The headline read: "Hall Brothers, Inc., The Makers of Hallmark Cards Announce the Hallmark Art Award - An International Art Competition Under the Direction of Wildenstein Galleries." This one-page advertisement inaugurated the first of five International Art Awards sponsored by the company. The stated goals of the competition were to "encourage fine art, ... to bring contemporary recognition to artists of today, ... [and] to broaden public appreciation of fine art." The first competition was limited to Christmas themes, "broad enough to allow for individual freedom of expression, yet sufficiently narrow to present all painters with the same initial challenging problem." Painters from France and the United States were invited to submit one work. More than ten thousand artists responded. A prestigious jury selected 100 works for inclusion in a traveling exhibition. Noted award-jurors included Lloyd Goodrich of the Whitney Museum of American Art in New York, Andrew Ritchie of the Museum of Modern Art in New York, and Alfred Frankfurter of Art News. The winning paintings were exhibited at the Wildenstein Gallery in New York City, the Institute of Contemporary Art in Boston, the Corcoran Gallery of Art in Washington, D.C., the Los Angeles County Museum, and the Nelson-Atkins Museum in Kansas City. 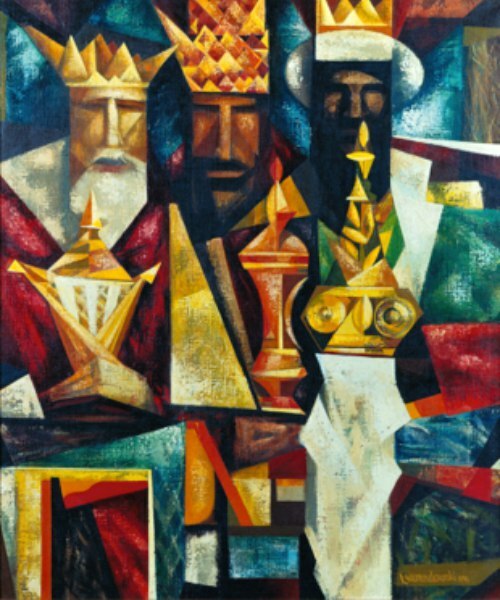 Among the painters who participated in the first Hallmark Art. 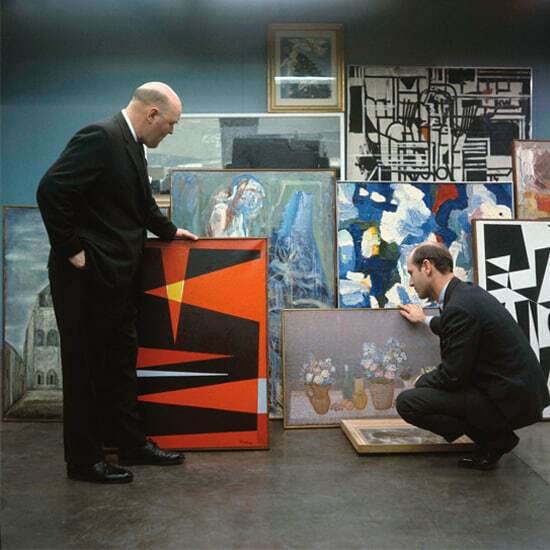 Twenty of the 100 paintings exhibited were purchased by Hall Brothers, Inc. including works by Eugene Berman, Jean Carzou, Philip Evergood, Edmund Lewandowski and Mitchell Siporin. 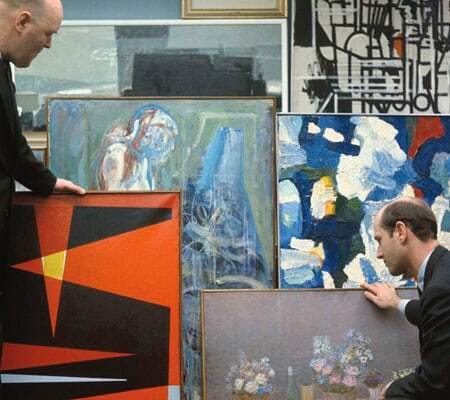 The company's second venture into international art was launched in 1952. While this competition was limited to watercolors on a Christmas theme, entry was open to "any artist over 18 residing in the Americas or in countries of Western Europe." Artists from thirty-three countries submitted 4,500 paintings. Although finalists were selected on the basis of artistic merit rather than geographic origin, the resulting exhibition included artists from fifteen countries. Jurors for the second competition included John Baur of the Whitney Museum of American Art in New York, Alfred Frankfurter of Art News, and art historian John Rewald. The touring exhibition of 100 watercolors traveled to the Wildenstein Gallery in New York, the California Palace of the Legion of Honor in San Francisco, the Carnegie Institute in Pittsburgh, The Cincinnati Art Museum in Ohio, the Dallas Museum of Fine Arts in Texas, The Institute of Contemporary Art in Boston, the Nelson-Atkins Museum of Art in Kansas City, the Portland Art Museum in Oregon, and the Walker Art Center in Minneapolis, Minnesota. A total of forty paintings from the Second International Art Award were purchased for the collection. In contrast to the first and second Hallmark competitions, which were open to all artists of selected countries, the third competition was by invitation. Contemporary artists from the United States, Canada, England, Ireland, France and Italy were asked to create paintings on a Christmas theme. In this way, works by such noted artists as Alex Colville, Richard Pousette-Dart, Maurice Utrillo, and Robert Vickrey were acquired. 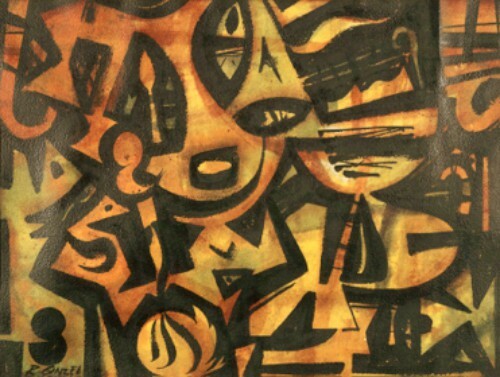 The 50 watercolors in this exhibition were noted for their impressive diversity of style and technique, and were seen by many thousands of viewers during a 21-city tour during 1956- 58. 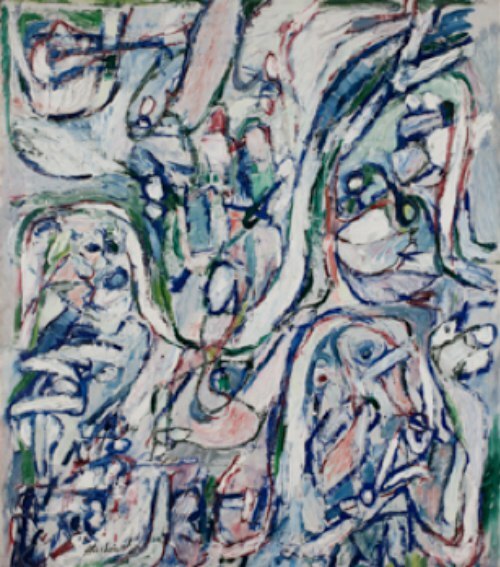 Highlights of the tour included venues at the Wadsworth Atheneum in Hartford, Connecticut, the St. Louis Art Museum, the Pennsylvania Academy of Fine Arts in Philadelphia, and the Des Moines Art Center in Iowa. 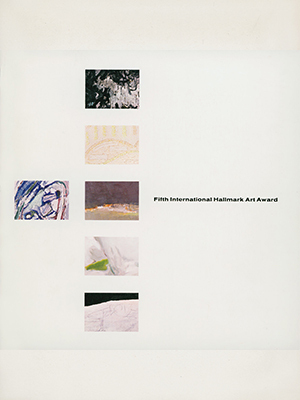 The Fourth International Hallmark Art Award was the first of the series to have no limitations on either medium or subject. The removal of thematic restrictions resulted in an exhibition that more accurately reflected contemporary trends in the art world. Fifty artists from sixteen countries in North and South America and Europe were invited to submit works. The result was a new level of quality and diversity, as important works by Edward Hopper, Peter Hurd, Charles Sheeler, and Kees Van Dongen, Maurice Vlaminck and Andrew Wyeth, were acquired. "The Hallmark Art Award competitions serve a dual function, besides contributing to the fame of the sponsoring company: They encourage and support, without in any way restricting, a number of contemporary artists. Furthermore, they stimulate public interest in contemporary painting through the well-publicized museum circuit of exhibitions. The artists and the industry have, in this instance, cooperated to excellent purpose, and it would be a fine thing for such a model to multiply." 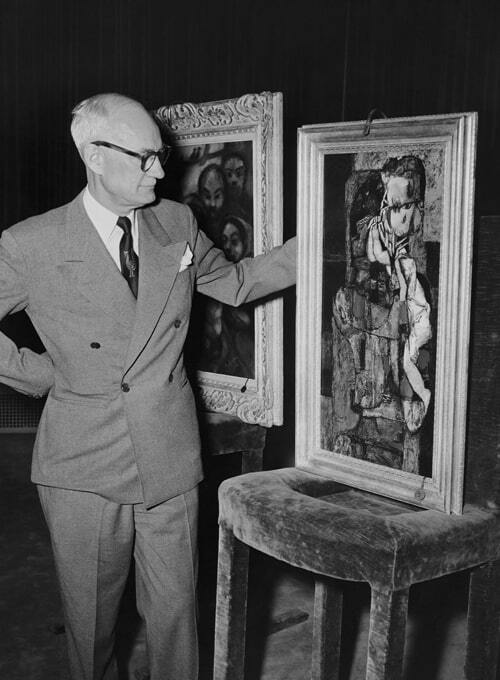 The exhibition traveled to 15 museums in 1958-59 including the Museum of Fine Arts in Boston, the New Orleans Museum of Art, the Corcoran Gallery in Washington, D.C., the Henry Art Gallery in Seattle, and the Santa Barbara Museum of Art in California. The theme of the Fifth International Art Award differed from the more general character of the previous exhibitions. A group of "Fifty Painters of Promise," ranging in age from 24 to 81, were selected by an international jury of distinguished critics. Among the painters chosen for inclusion in the exhibition were Pierre Alechinsky, Jane Freilicher, Ivon Hitchens, Elaine de Kooning, Kazuo Nakamura, David Park, Fairfield Porter, Arnulf Rainer, Thorvaldur Skulason, and Jack Youngerman. From the beginning, it has been our purpose to give today's "painters of promise" a helping hand and to provide millions of Americans across the country with an opportunity they might otherwise miss to see paintings in the full range of current styles and be able to feel their influence while it is still contemporary with our own lives. While paintings in the early competitions and invitational exhibitions were acquired for potential use in Hallmark product, the works in this exhibition were purchased strictly on the basis of artistic merit. This group of paintings is distinguished by a much larger scale and a prevalence of abstraction. The Fifth International Art Award exhibition traveled to 29 museums including the Denver Art Museum, the Joslyn Art Museum in Omaha, the National Gallery of Canada in Ottawa, the Arkansas Art Center in Little Rock, and the Mint Museum in Charlotte, North Carolina.